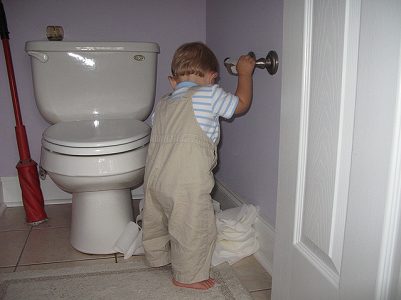 Home Child Safety , feature Frugal Child Safety: Save That Toilet Paper! Would you like to prevent your toddler or pets from unrolling the entire roll of toilet paper, and stuffing it into the toilet, or trailing it through the house? 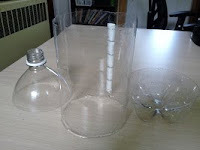 Make your own toilet roll cover/protector by recycling a plastic 2 liter soda pop bottle. 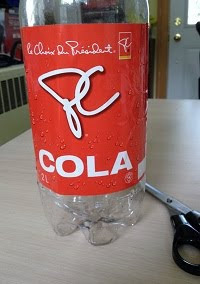 Cut off the bottle top and bottom of the soda pop bottle, to form your toilet roll cover/protector. Measure your wall mount toilet paper roll holder to see what size you need - mine was 4 3/4 inches (12 cm) across. TIP: you can use the leftover bottom to make fancy flower shaped ice cubes for punch - and the leftover top for a funnel for sand play! Cut a slot in this toilet roll cover/protector, to allow you to pull the toilet paper through, about 1/4 inch (0.64 cm) high and 4 inches (10 cm) across. If you are using double roll toilet paper, simply cut across completely - from one side to the other. If you wish, cover all raw edges with plastic tape to match your decor - I only had black tape on hand, but you can use any color to match your decor. If using double roll toilet paper, use a piece of plastic tape to tape across the open sides, attaching both sides, leaving an opening of about 1/4 inch (0.64 cm) or larger, for the toilet paper to hang out. Remove your toilet roll and spindle from the wall mount, slide both inside your new toilet roll protector, and reattach the roll to the wall mount. This should at least slow your toddler or pets down! Thanks to Catherine for this Frugal Baby Tip! • Paws-Free Toilet Paper Cover - Stops children and pets from unraveling toilet paper. You may have just saved the day! Before this, we used to chalk it up to "homespun toilet paper" and put it back on the roll all wonky. SO great, and it looks SO simple!!! I just thought of this myself and I don't even have pets or kids! You can also use a one liter bottle to cover paper towels on an upright roll to keep the roll tight and not unraveling sideways. You can cut it all the way across. It springs closed.